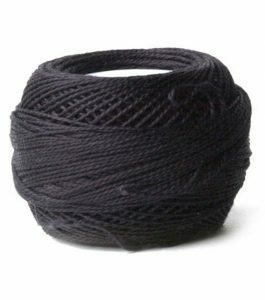 We’ve discussed the need for a high-quality thread before. It’s necessary to prevent your machine from acting up and causing you headaches. But how do you know if a machine embroidery thread is a high quality? And what if you use *a lot* of thread for serging? Do you have to spend a fortune on the expensive thread? Choosing the right thread for your embroidery machine is as important as choosing the right thread to construct a garment. You need the right kind of thread to get the results you want in your final product. When shopping for thread for your embroidery machine, do you feel overwhelmed by the vast amount of options out there? Shopping for the perfect thread is as fun as shopping for fabric, but the selection of brands, colors and fibers are endless. Choosing the perfect thread can be daunting when confronted by hundreds of different options. Just like with needles, there are different sizing systems in Europe and America, and the manufacturers usually put both types on a spool. So it can be really confusing. The possibilities are endless when it comes to machine embroidery. You might use your embroidery machine to add decorative patterns to your clothing. Some people use it for quilting. Embroidery machines can be used to add a touch of your own artistic style to things like home decor, appliqués, wall art, personalized work clothing, hats, beanies and even swim wear. Where do you start when choosing which thread will give you your desired result? This guide will answer these questions as well as go over the best machine embroidery threads of 2018. 7.1 How to tell if your thread is damaged. 7.2 Thread conditioner can help. 7.3 Decorative threads need special care. 7.4 Experiment to find your favorite threads. Madeira is a leader in producing high quality embroidery thread. Their line of Classic Rayon thread is durable with a high sheen and soft feel. According to Madeira Mart, the Classic Rayon thread, “runs exceptionally well on high speed multi-head machines” and “a soft hand is maintained, even with high stitch count designs.” It also comes in four different weights for different types of embroidery applications. Madeira Classic Rayon is the most versatile machine embroidery thread on this list. 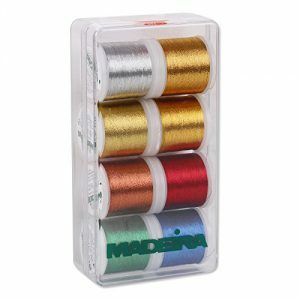 Madeira Classic Rayon embroidery thread has many positive reviews, but its consistency in high quality, ease of use, and versatility make it a winner among buying customers. The vast majority of reviewers praise that this thread never breaks. Many users also like how it glides smoothly through the fabric. One user even used it on silk with great results, so you might like this thread for high fashion embroideries. Although the price tag is higher than other brands, a great deal of reviewers say that the high quality you get is worth the price tag. It is important to note that rayon is a finicky fiber when it comes to laundering. Using bleach or color optimizers will alter the colors. It is also important to stain treat it with cleaners that DO NOT contain bleaching agents or harsh chemicals that will alter the color like peroxide or chlorine. You must also wash the item directly after stain treating it. Versatility: You could use it for a wide variety of embroidery projects. Lint Free: It will not leave fuzz in your machine. Requires special attention to launder. Vulnerable to bleaching agents and color optimizers. It is more expensive than other brands from the same class. Madeira Classic Rayon Thread comes in a variety of weights, so it can be used in a wide variety of applications. Since it is durable, pliable, lustrous and soft at high stitch counts, it works great for free standing lace. It can be used to add a touch of shine and dimension to quilting blocks and appliqués. You might like it for adding some character to your everyday fashion. 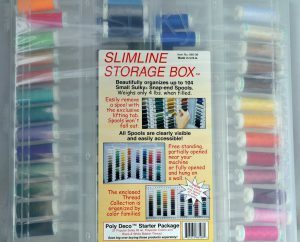 Since it comes in heavy and light thread weights, it also makes a great thread for lettering of any size. Other uses include embroidering home decor and linens. The possibilities are endless with this thread, and you can incorporate it into any project. In machine embroidery, Nylon thread is best used for stitches that you do not want to be visible in your design. In the machine embroidery world, invisible stitches are mostly functional in quilting and appliqué as these two crafts have a tendency to use fabrics with various prints and patterns. Mettler is a high quality brand, and the Mettler Transfil thread is the best choice for the task of achieving stitches that do not clash with your design. Nylon thread is known to be a headache to work with in any machine, but if you know some tips and tricks of working with this thread, it works great in embroidery machines. There were lass than a handful of mediocre reviews because it seemed like a weak thread. However, the raving positive reviews far outweighed the mediocre. It did appear the majority of the 3 star reviews were due to user error and lack of knowledge in working with Mettler Transfil Thread. One reviewer said it worked great on heavy duty fabric. The most popular strong point of this thread was that it worked in their machines where many other brands failed. Many also praised that it was softer than other invisible Nylon threads. Mettler Transfil 100% Nylon thread is reliable in a category where it’s hard to find a reliable thread. Fill the bobbins and thread your machine slowly and gently with this thread so that you do not stretch it. Being careful not to compromise the thread by stretching it will ensure that it functions properly in your machine. Mettler Transfil Thread has limited UV resistance, which means it should not be used in outdoor embroiders like patio furniture cushions. It is softer than other nylon threads in the same class. You have to be very gentle when working with this thread. Mettler Transfil Thread can be used in any application that requires the use of invisible thread like appliqué, quilting, and trapunto designs. Do you have a design where you want distinctive decorative stitches? Cotton thread is great for achieving stitches that “pop out” on a design. Decorative stitches that catch the eye are popular among quilters and appliqué artists, and DMC Cotton Thread delivers desirable results. DMC’s cotton thread is premium quality and comes in over a hundred solid and variegated colors. It is soft and pliable with high tensile strength. It is highly mercerized, so it has a delicate sheen that is not as glossy as other high shine threads like rayon or silk. Among die hard fans of DMC’s cotton thread, the most popular advantage of using this thread is that it never leaves lint behind and runs smoothly through machines without breaking or fraying. People who use DMC’s cotton thread are in love with the variety and quality of the color selection. DMC offers cotton thread in a wide variety of shades and variegates with rich colors that never fade. Many reviewers praise that DMC Cotton Thread is something they always keep in their stock because it maintains its quality for many years without fading. DMC’s cotton thread is not limited to quilting and appliqué. You might like using it in any project where you want your decorative stitches to be distinctive. Users of this thread have had great results with applications like home decor, clothing embellishments, and heirloom embroideries. Do you need a thread that can stand up to everyday use, stain treatments, heavy washes and high heat from ironing and dryers? 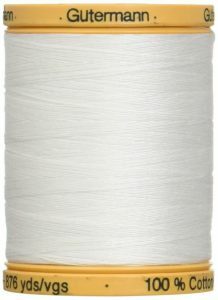 If so, than you might want to consider polyester thread, because it can endure a lot of wear and tear. 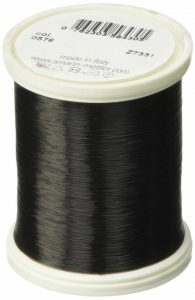 The best polyester thread comes from Sulky’s lines of Poly Deco and Poly Lite embroidery threads. Sulky’s Poly threads are color fast, harsh chemical resistant, and heat friendly. 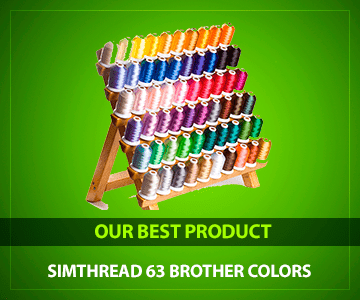 It has a high luster and comes in a variety of appealing solid colors, thread weights and spool sizes. READ What is a Birdnest? People who use Sulky Polyester thread all agree that it runs nicely through embroidery machines with no breakage, fraying or lint buildup. It has a lustrous sheen that is almost as shiny as rayon. Some people even use the two interchangeably in a pinch. For a synthetic fiber, it is still pretty soft to the touch. Comes in a variety of weights on spool sizes. Variegated colors are few and hard to come by. Because it is a laundry friendly and chemical resistant thread, you could use Sulky Poly threads for a variety of machine embroidery projects. It works well for embroidering children’s clothing, sports jerseys, patches, swim wear, active wear, work clothes, linens, bed spreads, and anything that you would stain treat or throw in the washing machine on a regular basis. The possibilities are endless. Sulky’s Poly threads make somewhat stiff embroideries with lots of body, so you might not like it for delicate applications like free standing lace. another natural fiber, silk has the stability of cotton and the strength of polyester but a shine that is unlike any of its counterparts. Gutermann’s silk thread meets all of the hallmarks of quality silk embroidery thread. It comes in many rich colors that add luminous dimension to embroideries like no other thread. Gutermann Silk Thread performs well on embroidery machines. It is lint free with no fraying, breakage or stray loops. It is the softest of all of the threads and makes nice supple embroideries. It also has the richest and deepest colors. Machine embroidery with Gutermann Silk on delicate fabrics like cotton batiste makes beautiful and flowing embroiderers. 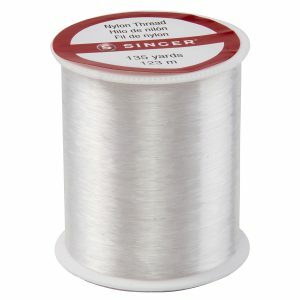 It is expensive for the amount of thread you you get on a spool. Gutermann Silk Thread works great for small ornate details and decorative hems. It’s also suitable for embroidering high end fashion wear such as evening gowns and bridal wear. 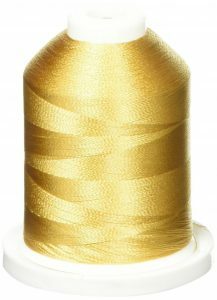 Silk thread would also work beautifully on light fabrics like chiffon and silk. You have five main types of thread to choose from: cotton, nylon, silk, polyester and cotton-wrapped polyester. And they fall into three basic categories: general purpose, heavy duty and decorative. Cotton is an all natural fiber. Cotton thread is a soft and durable thread that can come in a wide variety of colors. Cotton thread works great when you want to achieve a smooth matte finish or want to include decorative stitches that stand out in your design. Most cotton thread on the market for machine embroidery is a mercerized form of cotton. Wikipedia states that mercerization is a process that alters the structure of cotton to make it stronger and give it a slight lustrous sheen. Cotton is a widely used thread, but some cotton threads tend to be linty. Although mercerized cotton does have a slight sheen, it still has a pretty matte finish compared to rayon or polyester. Silk thread is a natural fiber. It is incredibly soft and pliable with very high strength. Silk is the most expensive option for machine embroidery, but it is a high quality thread that produces stunning embroideries. Nylon thread comes in many varieties, but for the purpose of this guide, we will focus on the nylon clear thread. Also known as invisible thread, it is another synthetic thread known for its slight stretchy properties and lack of color choices. 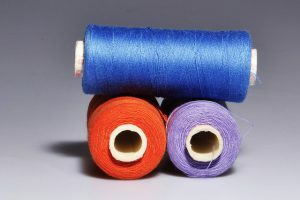 Nylon’s chemical name is polyamide, so if you see the name “Polyamide” on thread spools in stores and on product descriptions, bear in mind that polyamide is completely different and unrelated type of fiber than polyester. Polyester is a durable synthetic fiber. Most polyester embroidery thread consist mostly of trilobal polyester, a type of polyester that is stronger than rayon and has a comparable shine. Trilobal polyester is also color fast, meaning it is resistant to color fading and color bleeding. It is also resistant to harsh chemicals like chlorine bleach and optical brighteners, as well as abrasion resistant, which means it will stand up to wear and tear. It is has little to no lint. 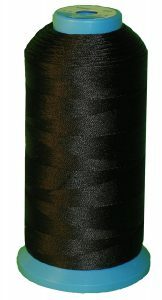 This thread is the most popular choice overall because of its attractive high sheen, widespread availability, and consistent trouble-free performance, holding up to high-speed stitching without breaking or fraying. For heavy-duty sewing on things like canvas, vinyl, leather or upholstery fabrics you need a heavier weight thread. Size 40 is the most common for heavier sewing, and you can find it in all the fibers listed above. How to tell if your thread is damaged. Light will cause thread to deteriorate. And the cheaper the thread, the faster it goes bad. Hold a strand up to the light and look at the fibers. If the thread is smooth and strong, you’re good to go. If you see all sorts of fuzzy bits or the thread seems rough, throw it out. It’s no good to anyone, not even for hand sewing. Store your thread in a light-proof container to keep it in good condition. You can also use thread conditioner to smooth out questionable threads. If you’re sewing by hand, just run the strand through some beeswax to lubricate. If you’re sewing by machine, especially industrial sewing, you can purchase special containers for silicone liquid thread conditioner. The container sits near your machine and the thread runs through it to be coated with the conditioner before winding its way through your machine. Decorative threads need special care. There are all sorts of specialty threads from sparkly metallics to shiny nylon and silk for embroidery machines. These can shred and cause all sorts of problems if you don’t pay close attention. Make sure your machine is designed to handle decorative threads. Usually, all you have to do is change to a special needle with a wider groove down the shaft. 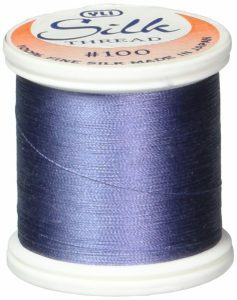 They make needles especially for metallic thread and embroidery thread. You may also need to use a stabilizer or embroidery hoop with your fabric when sewing with specialty threads. Experiment to find your favorite threads. Everyone has their favorite thread they buy all the time. Some people swear they never ever use cotton thread, and others do just fine with it. The truth is every sewing machine and ever fabric has a different tolerance for what type of thread it will take. So, experiment with different levels. Personally, I use a lot of thread because I do a ton of serging. After lots of experimenting, I’ve found my Viking Huskylock does just fine with the cones of thread I can buy at my local fabric store. It’s not the cheap “5 spools for a buck” thread, but it’s not the highest quality either. But my machine is happy with it, so I’m happy. Remember that 90% of sewing machine problems happen because of the thread or needles. Before you get angry or frustrated at your machine, try a different thread. It might just save you time, money and headaches. Machine embroidery is a rewarding craft, and it can be a little overwhelming. There are so many threads to choose from! We think you will find the right machine embroidery threads that will suit your needs in this guide. Whether you need a strong shrink resistant thread to embroider your children’s clothing or a soft and supple thread to bring a free standing lace design to life, you might be able to find the best thread for the job right here, so remember to check out this guide when you need a little direction in finding the perfect thread for your next machine embroidery project.